The Night Before is brought to you by the same folks who did "This is the End" and "Neighbors" and they've outdone themselves again. 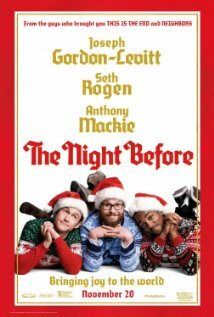 This comedy follow three best friends: Ethan (Joseph Gordon Levitt), Isaac (Seth Rogan), and Chris Roberts (Anthony Mackie) and their Christmas Eve tradition that's ten years and counting. The reason for this tradition is for you to find out but it's really touching. This year will mark the end of the tradition because, with time, life has become too busy for each friend. In the movie adaptation of The Night Before, this is done in a similar way to the Christmas Carol — each of the three receives a vision related to their lives. The spirit showing them this vision is a weed dealer and the only way for the vision is to smoke this special weed. The dealer, Mr. Green's (Michael Shannon) wisdom makes for some good laughs. Each friend is going through some trial in their lives: one is focused on their tradition and making the last time they spend together the most memorable while also figuring out his love life, one is just high on the drugs his wife gave him as a gift to have a wild night and one is the supplier of the weed for the party and wants to look cool to the others. Together, they're trying to make it to the party of all parties. I laughed throughout The Night Before but just like "This is the End" and "Neighbors", the rating is R for a reason. If you liked those two flicks, I'd recommend this one too. Some actors and artists make a special appearance later in the movie and make it even funnier as well. But even with all the R-rated comedy, this movie still delivers a message about the importance of friends and family, especially during the Holidays.